LEAD TIMES: Delivery will generally be 8 weeks from approval of finished artwork. Late orders received in October/November, will in most cases still be supplied prior to Christmas, but you need to check this at the time of ordering as it depends on demand at this time of the year. Rush or urgent orders can usually be accommodated. 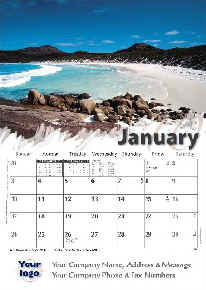 If you order from our generic range (whether you supplied finished artwork or once we have completed artwork and layouts) we will fax or email an artwork approval form for your approval.We will not proceed to overprint your calendars unless we have received an artwork approval form signed off by you. You can either supply-finished artwork to our specifications or you can simply provide the information and graphics (if any).Logos and any graphics supplied should be to our specifications. If you cannot supply these to our specifications you will be charged an additional fee to redraw these to the required specs.All logo’s and graphics need to be supplied as PDF,jpeg, or tif files at 300 dpi or higher at actual size. If you require clarification of this you can email our graphic arts department for help. We can overprint Your company message and logo in choice of 1 colour black, or 1, 2 or 3 colours, or 4-colour process (Full colour). You must specify how many colours you require in your overprint message and you must specify pms (pantone matching system) colour numbers. If you cannot provide pms colour numbers a colour sample can be submitted and colours will be matched within normal commercial tolerance but will not be exact. Every colour in your artwork requires a separate plate to be made. 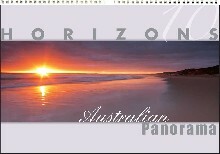 1 colour = 1plate, 2 colours = 2 plates, 3 colours = 3 plates, 4 or more colours = 4 plates (4 colour process). If you choose 2 ‘types’ of calendars you will require twice as many plates. 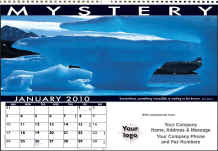 Even though your artwork maybe the same, each ‘type’ of calendar requires it’s own set of plates. 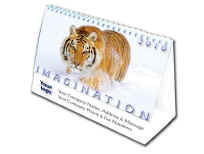 If you have 3 ‘types’ you will require 3 sets etc.If you want to keep the cost down it is best to choose 1 ‘type’ of calendar only. What if you have multiple branches? If you wishe to advertise several different branch addresses independent of each other then it is best (and cheapest) to keep any changes to the overprint message to a single colour. Standard price list unit costs include printing your logo or message in 1 colour black. SE12 limited edition is overprinted in 1 colour Gold only. 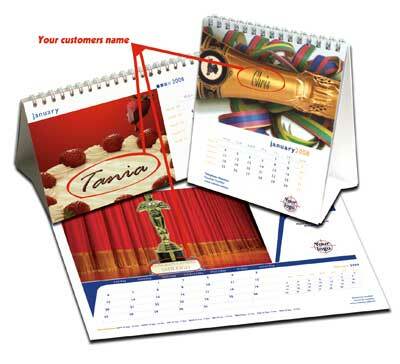 You cannot have different logos or messages overprinted on different pages of the same calendar. Each page must carry an identical logo and or message.